The hot summer days that we’ve quickly grown accustomed to have started to disappear just as quickly as they arrived. In addition to the cool nights and slight yellowing of leaves, there’s another indication that the beginning of the fall season is here, football! 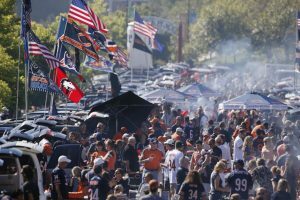 And with football comes one of America’s favorite pastimes – Cooking, eating and drinking in a parking lot full of fellow revelers, aka, tailgating. And while determining the food options may be the first thing that comes to mind when planning a tailgate, there’s another very important aspect to consider, the vehicle. We looked at pickup trucks in particular, as these are the classic tailgating vehicle of choice. While these trucks have numerous other features and innovations that make them great choices for work applications, we’re mainly focusing on the ability of each to enhance your tailgating experience. What we found is that influences of this pregame pastime have become prevalent in the design of modern pickup trucks. The best-selling truck in the U.S. makes our list thanks to the benefits it offers to the pregame partier. 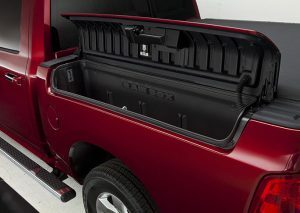 The Ford F-150 offers a hidden step that can be deployed from within the tailgate, making it easy for you to access your grill, bags games, and other necessities. Ford also makes deployable side steps available on all cab configurations, helping to make it easy for the short-statured revelers to access the truck bed. Furthering the ease of access is the remote tailgate system that can be released by using the key fob. With a best-in-class maximum payload of 3,270-lbs. and towing capabilities of up to 12,200-lbs., Ford makes it easy for you to come fully equipped with a truck bed and trailer full of the necessities. So whether you’re towing equipment to a job site, or just pulling a barbecue to the tailgate, the Ford has plenty of capability to handle towing for both work and play. However, if you want to set up the big screen in the truck bed, you’ll need to move up to the F-350 in order to get the 110-volt/150-watt power inverter. The 2016 RAM 1500 offers abundant cargo space in the full-size bed that includes a waterproof RamBox® storage system. These drainable storage compartments are incorporated into the side rails and include LED lighting. So whether you’re using these to store tools, or want to fill them with ice and some refreshments, the RamBox compartments will make it easy to load and unload your work or pregame accessories. The RAM also makes Uconnect Wi-Fi capabilities available at $10 for single-day access, helping to keep your group connected and up-to-date on the pregame injuries and Fantasy updates. The RAM also features an air suspension system that lowers the frame and makes it very easy to load and unload your grill, chairs, and other essentials. Another major player in the US truck market, the Silverado focuses on ease-of-access and use in order to differentiate their truck. The updated perimeter bed lighting features under the rail lamps that make loading and unloading easy, even after those late night games. Another aspect focused on ease-of-use if the EZ Lift & Lower tailgate, which was engineered to slowly lower itself into the flat position, while also being light enough for the younger members of your crew to lift and close. In addition to the CornerStep rear bumper and pocket hand grips, the High Country Trim level makes power articulated steps available that can be released by simply tapping the end with your foot. The standard 4.3-liter V6 engine has a maximum towing capacity of 7,600-lbs. If you’re looking to haul heavy equipment once the workweek begins, the 6.2-liter V8 affords a one-ton-plus payload capacity and a 12,000-pound max towing capacity. The Silverado is also 4G LTE Wi-Fi enabled, making it a perfect for hotspot streaming the pre-game coverage while manning the grill. Higher trim levels are also returning with a standard power sliding rear window, helping to keep the cabin fresh and clear of any barbecue smoke that may be lingering. While this isn’t the biggest or baddest truck on the list, it does have numerous unique features that make it ideal for these Sunday gatherings. The 2017 Ridgeline has the only 4-foot wide flatbed within the midsize pickup class, allowing you to lay tables or plywood (only on work days, of course) flat along the floor of the bed without issue. In addition to this, the lockable In-Bed Trunk® provides secure storage space without sacrificing the functionality of the bed. This ‘trunk’ is hidden below the bed at the very rear, just off the tailgate. This compartment even includes a drain, making it perfect to load up with ice and beverages which will simply drain as the ice melts while you’re enjoying the game. 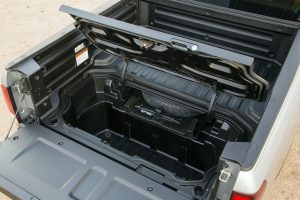 Another unique aspect of the Ridgeline is the dual action tailgate, which can be opened like a conventional swinging door and can also swing down as traditional tailgates do. The industry first in-bed audio system uses six exciters instead of traditional speakers, which are hidden inside the bed walls. These are connected to the head unit on the dash and can output up to 540 watts of pregame coverage and audio bliss. There’s also an available 400-watt AC power inverter within the right truck bed wall with the capacity to power your flat screen, crock pot, or tool accessories, making sure you’re able to power what you need during pregame and also the next day when you return to work. A nice feature available on the Sierra is the Tri-Mode Power Steps that automatically retract when not in use, affording a clean and seamless look to the truck. The Sierra also has a CornerStep rear bumper with integrated handholds to make accessing the box even easier. The high-strength steel bed instills confidence that your potentially raucous group won’t do it harm. Like other options on this list, the available LED box lighting will keep your truck bed illuminated. Furthering the storage capabilities, the 60/40–split rear seats fold up onto the back wall, ensuring you can keep your flat screen dry if game-day is a rainy one. The available mobile Wi-Fi Connectivity Package turns the Sierra into a mobile hotspot capable of connecting your group’s devices. And if you’re in the market for the higher-end trim level, the Rear-Seat Entertainment system can provide entertainment for any youths that may not be involved in the grilling and gaming that typically ensues. All in all, any vehicle would work for hosting a tailgate party, as the success mostly depends on the people and atmosphere that you bring to the event. However, when looking to stand out as a true tailgating aficionado, while also making it easy on yourself, it’s important have the proper equipment and to do so in style.